This is the fourth in a series of seven articles that will catalogue an important group of drawings by John Ruskin at King’s College, Cambridge. For general notes on the collection see under article #1. I have to admit that progress with the catalogue has been somewhat slow: Part #3 appeared in 2014. Graphite, pen and ink with brown and blue-grey washes, on smooth white wove paper, 12 3/4 x 19 1/4 ins [as measured 12.07.2012 DH, 322 x 493 mm (sight)] in good-quality old washline mount, but not acid-free and wants replacing. This watercolour is in very good condition, and represents a confident, virtuoso piece of draftsmanship, combining energetic handling, with tight control of detail. The colour was always muted, painted in a combination of sepia and blue-grey washes. 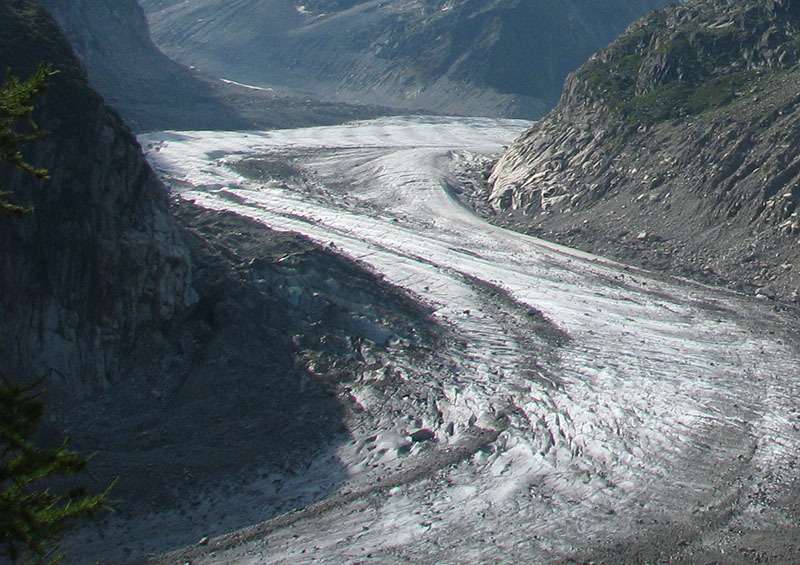 The subject is the famous glacier of the Mer de Glace, a little way -east of the French Savoy alpine resort of Chamonix. The viewpoint is a window in an upstairs room of the old Montanvers Hotel. 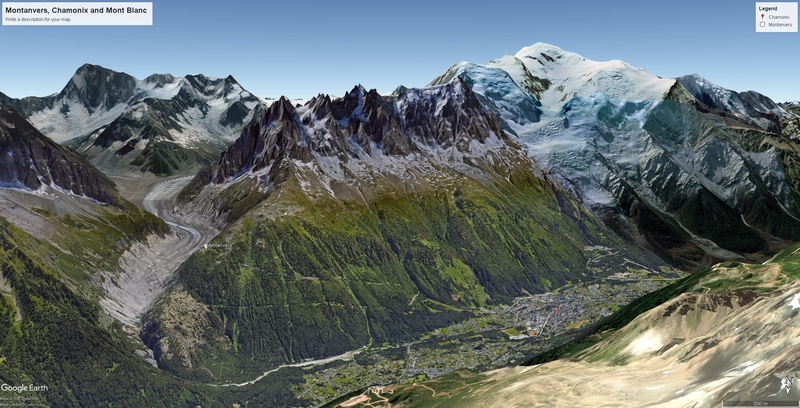 The view of the glacier is flanked to the left by the les Echellettes, from where the ridge rises to Les Drus (3754m) out of the composition top left, and flanked to the right by the Tete de Trelaporte from where a rocky ridge rises to the summit of the Aiguille des Grands Charmoz (3444m), out of the composition top right. The major peak in the centre distance is the Pointe Walker (4208m) of the Les Grandes Jorasses, and the ridge of the Franco-Italian border peaking over 4000m with the Dome de la Rochefort (4015m) and Aiguille de Rochefort (4001m). The latter stands at the far end of a ridge that rises from the glacier in the centre of the composition via the Aiguille de Tacul (3444m). The drawing is slightly vague to the right of the Aiguille de Rochefort, but just in view from this point of view, is the Aiguille du Geant (4013m) cutting a distinctively sharp triangular silhouette. The site became famous following a bivouac there by the English visitors Pockocke and Windham in 1741. They were followed by a steady trickle of visitors, which with the publication of more and more guidebooks became a stream. The first refuge was opened there in 1779 and demand was so great that a proper hotel was built in stone in 1840. That provided Ruskin with his room, and is still standing to this day. Despite the fact that the only access was on foot or on muleback, the old hotel was joined by an exceedingly grand new building in 1880, which still offers great comfort as the ‘Refuge de Niege, Montanvers’. In 1909 a mountain railway was completed to bring visitors up from Chamonix in ease, and today that carries thousands daily in the season. 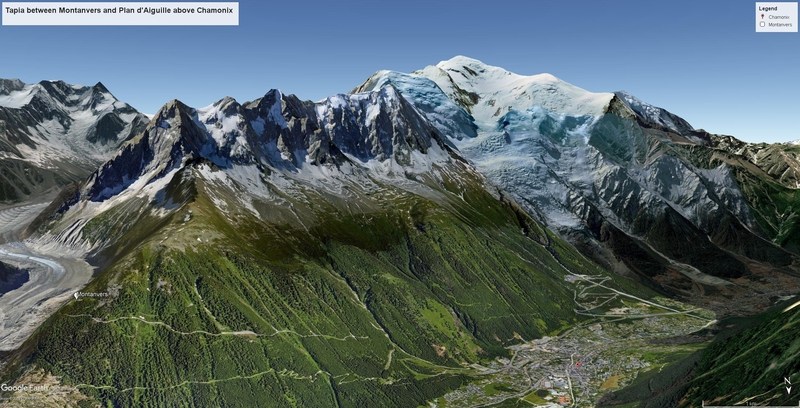 The Montanvers Hotels and the Mer de Glace. The 1840 hotel in which Ruskin stayed is to the right. The larger building is the present day Refuge du Montanvers, built in 1880. 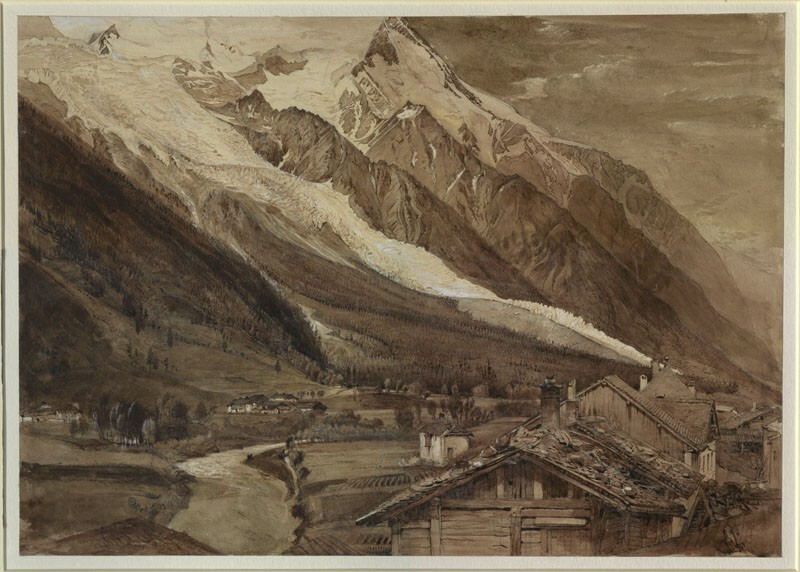 Ruskin painted that from the Hotel de l’Union at Chamonix, over several days, and as a result is even more highly developed. Ruskin claims to have been hesitant about using colour, not being able to process form at the same time as colour. He later writes about the contrast between the schools of Greece (form and chiaroscuro) and the Gothic (colour and pattern) in the Oxford lectures, where the dichotomy in his own practice became reified into an educational programme and a history of art. 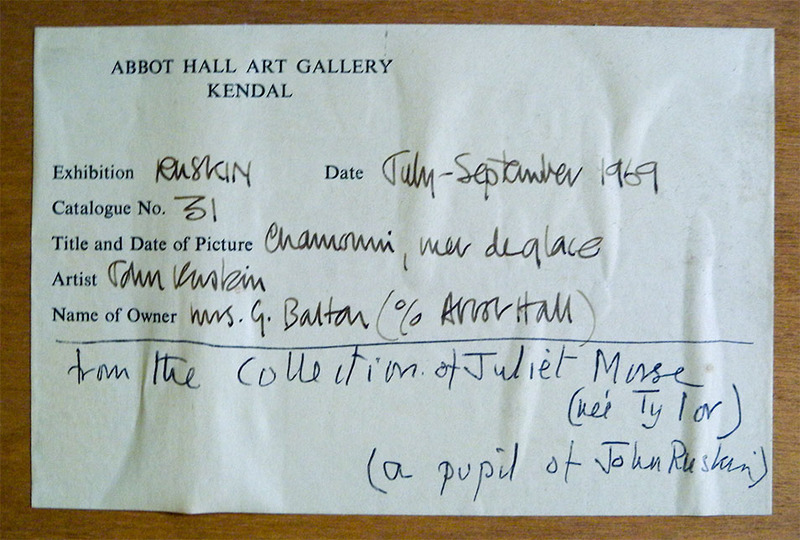 The Abbot Hall 1969 exhibition label is inscribed with a note: ‘From the collection of Juliet Morse (nee Tylor) a pupil of John Ruskin’. But this is incompatible with the Squire Gallery label that categorically gives it to Acland and the 1907 Alpine Club exhibition. 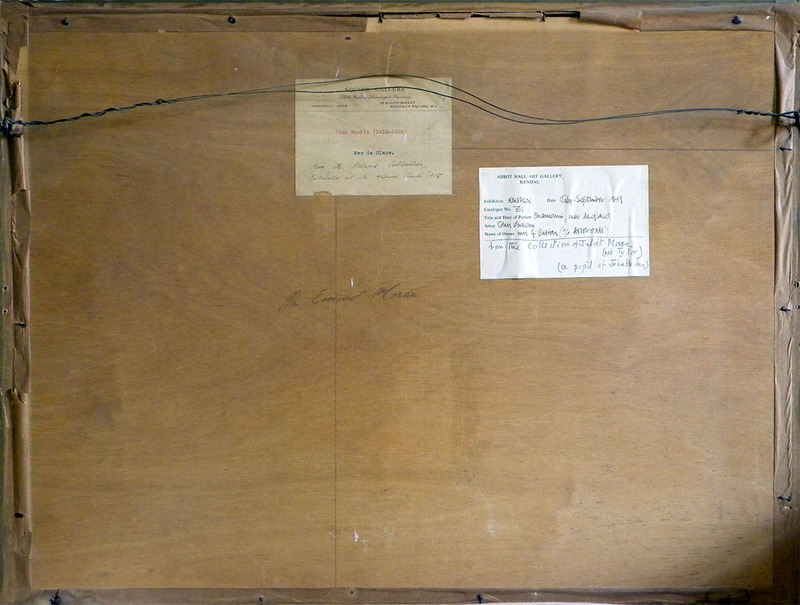 Rather it appears to have been an Esmond Morse purchase [presumably from Squires], and the note on the Abbot Hall label reflects a mistaken presumption of Mrs Guy Barton (nee Morse). The entry for this study in the catalogue of Ruskin’s drawings in the Library Edition of Ruskin’s Works no.441 refers to the exhibition at the Alpine Club in 1907 and expressly says ‘This beautiful drawing was specially made for Sir Henry Acland’. 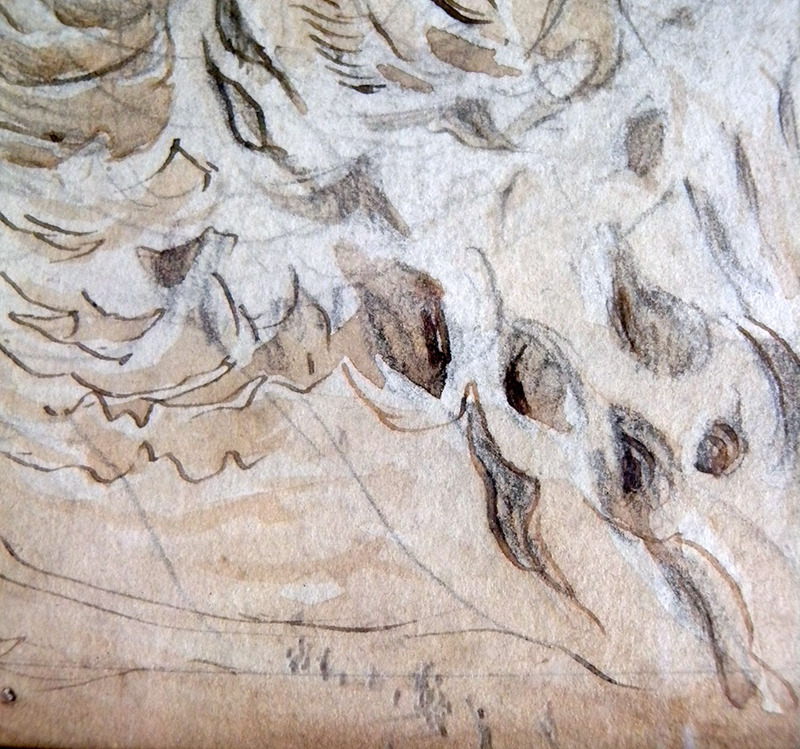 Ruskin’s muse in this drawing was the geologist James David Forbes. His great book, ‘Travels in the Alps of Savoy’, first published in 1843, was by far one of the most scientifically important studies of the Alps. This book was the first to properly describe the true nature of the motion and agency of glaciers. If that were not important enough, it also proposed a conception of the ebb and flow of glaciers over deep time. He was already well-known by the time Ruskin began to cultivate serious Alpine ambitions of his own. 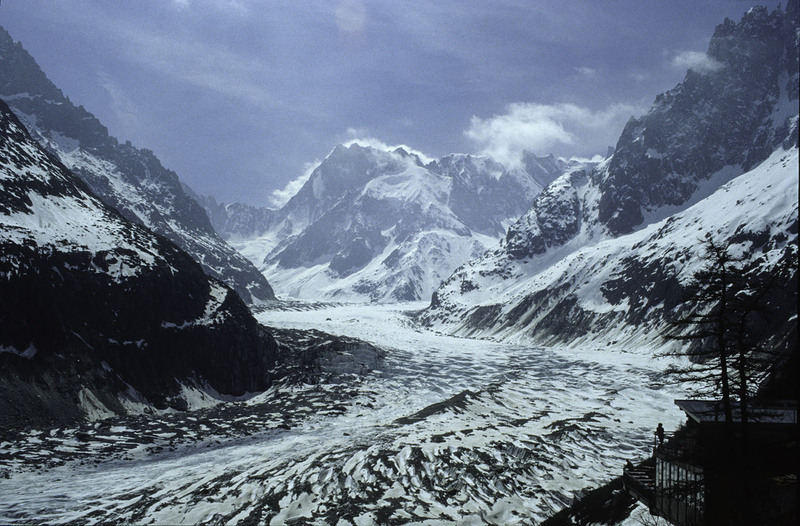 Forbes had done most of his fieldwork for the book on the Mer de Glace in 1842. Ruskin was himself at Chamonix in 1842, but might not have been aware of Forbes’s work at that time, but he was certainly aware of his reputation when their paths crossed at the Simplon Pass inn in 1844, and Ruskin was starstruck and not a little embarrassed when his parents inveighed the great man to look at their talented son’s own Alpine work. ‘Henry Acland, by about a year and a half my senior, chose me; saw what helpless possibilities were in me, and took me affectionately in hand. His rooms, next the gate on the north side of Canterbury [quad], were within fifty yards of mine, and became to me the only place where I was happy. He quietly showed me the manner of life of English youth of good sense, good family, and enlarged education; we both of us already lived in elements far external to the college quadrangle. He told me of the plains of Troy; a year or two afterwards I showed him, on his marriage journey , the path up the Montanvert; and the friendship between us has never changed, but by deepening, to this day. 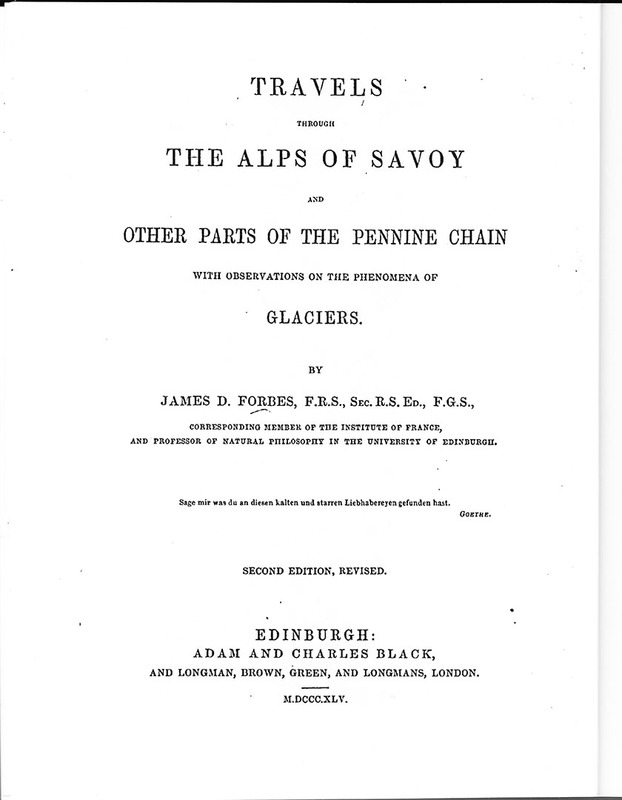 The 1846 walk on the glacier with Acland might almost provide an occasion for this study, except for the fact that in that year Ruskin was only at Chamonix for four days, and the documentation proves that, apart from the excursion to the Mer de Glace with Acland, he was rained off or otherwise engaged. We do not know how or when the watercolour passed to Acland; nonetheless their shared exploration of the subject certainly must have given it special significance. 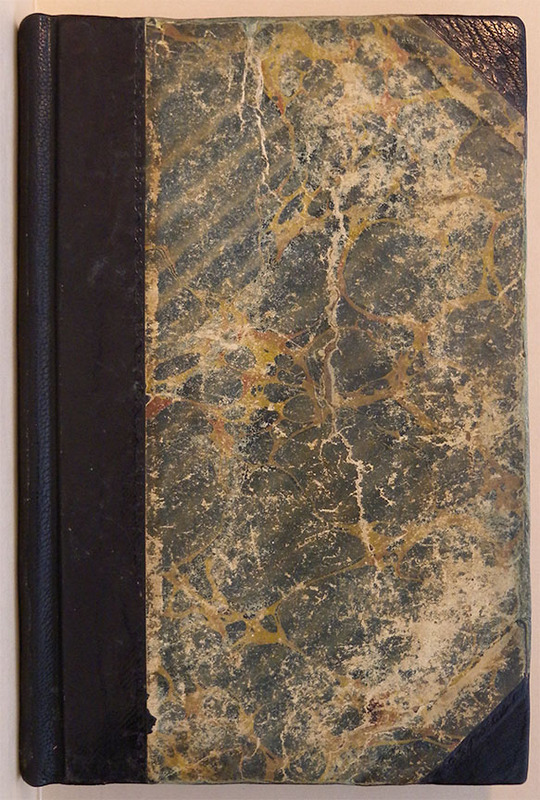 The principal documentation for Ruskin’s Alpine travels, apart from drawings and letters, is the diaries and notebooks kept by Ruskin himself, mostly at the Ruskin Library at the University of Lancaster, and also in the case of tours of 1846, 1848 and 1849 a diary kept by his valet, personal assistant and general factotum, John Thomas Hobbs, now at the Morgan Library, New York. 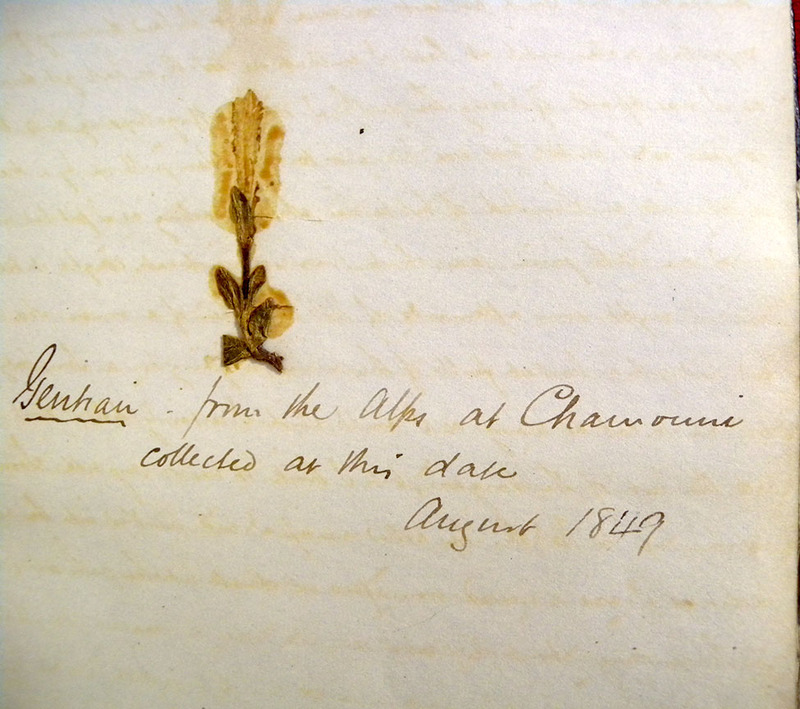 Ruskin was at Chamonix three times in 1849, and both his and Hobbs’s diaries contain copious detail. 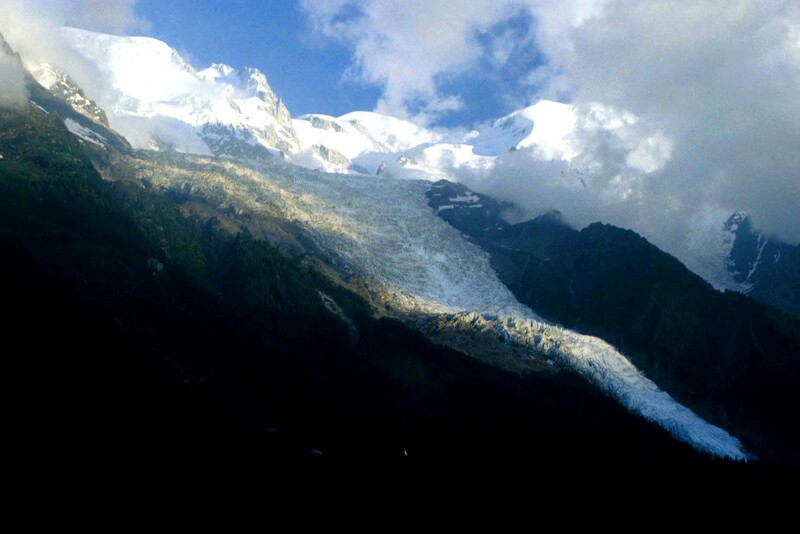 Sifting through it, however, it is clear that Ruskin’s main work was on the Tapia, the extensive sloping area of moraine, glacier and rubble that stretches between the foot of the aiguilles and the forest above the valley from the Montanvers to Plan de l’Aiguille. His main objectives were to try and understand the true forms of the aiguilles and the proper character of their geology. 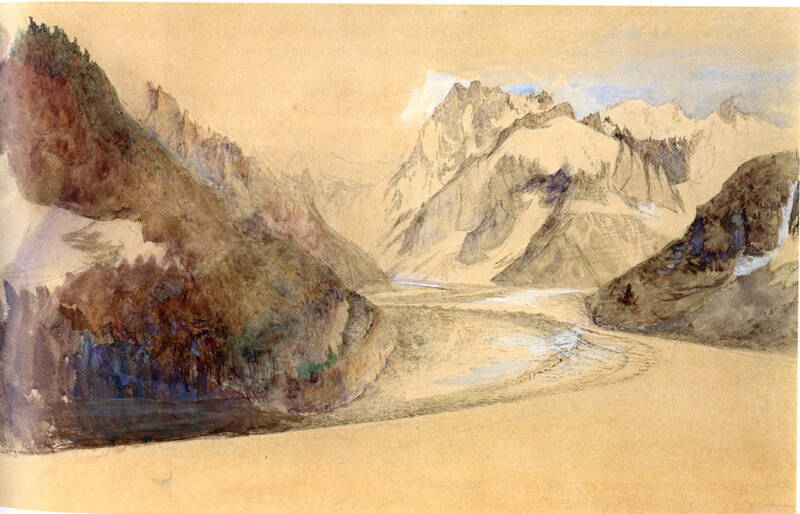 I hope to find opportunities to continue exploration of the work of 1849, but the Mer de Glace and the Montanvers remained somewhat peripheral until the end of Ruskin’s third visit of that summer to Chamonix, 15-30 August when the opportunity arose to make the present watercolour. Unfortunately Hobbs’s diary finishes on 18 August. Presumably it must have been continued in a separate volume as yet undiscovered, but by way of some compensation the Morgan Library volume does close with a pressed Alpine Gentian, collected on the Tapia on that final day. Ruskin’s Diaries, however, are exceptionally detailed for this period. We discover that he was walking up to the Tapia from Chamonix almost daily – a climb of over 1000m, and then often the best part of another 1000m up to the foot of the aiguilles. At thirty years of age, he must have been in the best physical shape of his whole life, but even so, he decided to reduce the labour for a few days by staying at the hotel at the Montanvers for three nights, 22-25 August. The interlude came as a revelation: On 22nd he wrote ‘I think I never enjoyed any evening so much as this in my life.. I had no idea what this place was, until I sat at the window quietly today, watching the sunset and the vast flow of the ice, swelling down the gorge – a dark and billowy river – yet with the mountainous swell and lifted crests that the iron rocks have all round it.. I have certainly not lately nor often in old times, felt stronger emotion than in watching the dawn from the Montanvert these three mornings past. Yesterday I saw it when it was still very dark and Orion burning beyond the Grandes Jorasses, and the whole river of heaven, between the hills, full of stars; and again later, when, as I was watching the increase of the serene, clear, cold morning light, a beacon intensely flashed out on the summit of the Dru. It was the morning star. I was up early to-day, and drew the Aiguille Charmoz before breakfast; then worked on glacier; then took a little ramble among the myrtilles on the hill-side: came in again and finished glacier, and [afterwards] descended to Source of Arveron [and thence back to Chamonix]. Whilst Ruskin was drawing and making geological observations, his assistant John Hobbs (or ‘George’ as Ruskin called him) was working on a parallel project of equal, if not even greater significance. In 1845 Ruskin had become interested in the new photographic process of daguerreotype. In 1839 Louis Daguerre sold his patent to the French government and in 1841 a British patent was bought by Richard Beard in London. Briefly, the process involved a copper plate with a coat of polished silver being sensitised to light with fumes of iodine and bromine. The image could be developed with mercury fumes, and fixed with a salt and soda solution. Despite the complexity and uncertainly, not to mention toxicity, of the process, daguerreotyping was rapidly improved and commercialised, and the equipment produced in sufficient quantity for ‘home’ use. Ruskin invested in his own equipment and Hobbs trained in its use. 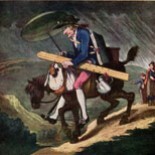 The diaries of 1849 feature a variety of references to Hobbs lugging the equipment around and carrying it on his back up lengthy climbs sometimes made arduous, even delirious, by hot weather and thirst. From the references it is plain that Hobbs attempted a significant number of daguerreotypes for Ruskin. The fallibility of the process mean that many of his effort resulted in disappointment,, but there were also several moments of exhilaration. After John Hobbs moved on from Ruskin’s service in the early 1850s, Ruskin trained a subsequent assistant Frederick Crawley from 1853 to make many more. A large number of daguerreotypes survive, many at the Ruskin Library and another large collection with Ken and Jenny Jacobson. 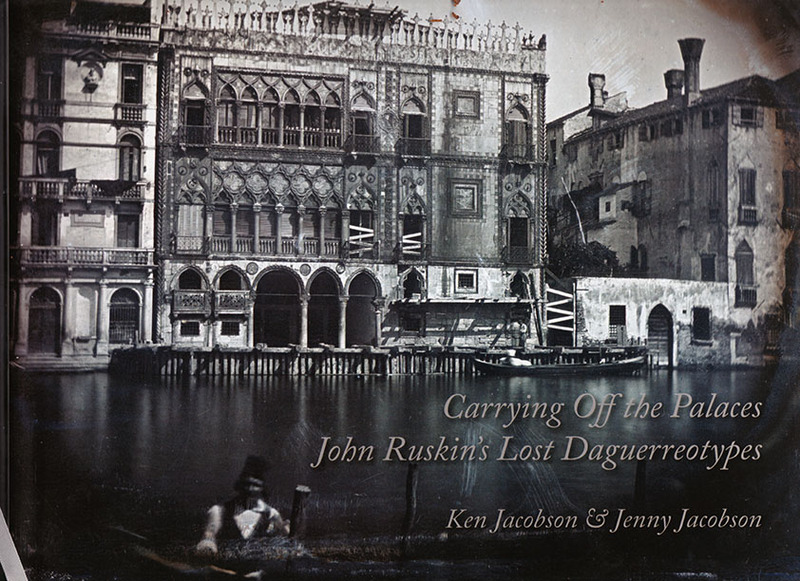 In 2015 the Jacobsons published a complete catalogue of all those surviving in a splendid book, ‘Carrying Off the Palaces: Ruskin’s Lost Daguerreotypes’. Thus Ruskin and Hobbs were in the avant-garde of Alpine photography. Ruskin even claimed that Hobbs took the very first photograph of the Matterhorn when they were at Zermatt in 1849. That might actually be the case, and in any event Ruskin and Hobbs were most certainly at the cutting edge of representational technology and philosophy. 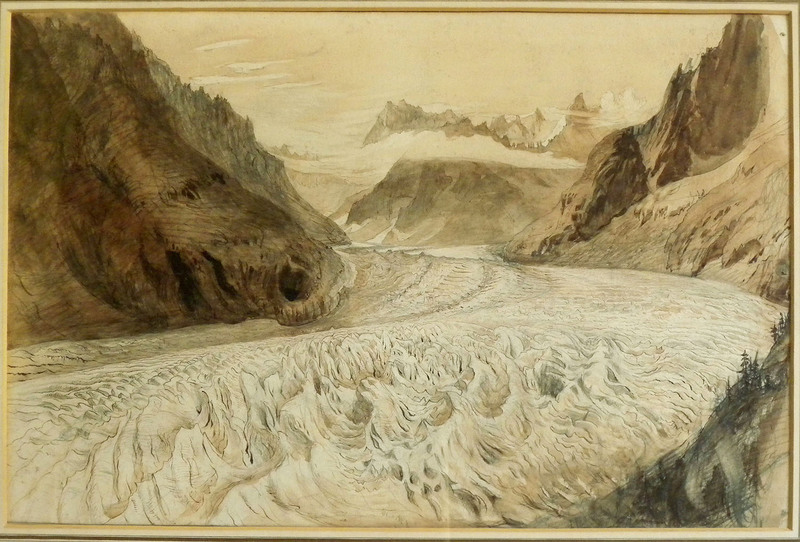 A daguerreotype of exactly this view of the Mer de Glace survives at the Ruskin Library, Lancaster (RF Dag 75) and although it is given to Crawley and dated 1854 by both the Jacobsons and the catalogue of the Ruskin Library, it seems almost certain that Hobbs must have taken the subject during his stay at the Montanvers in August 1849. Were it not for the attribution by the Jacobsons and the Ruskin Library, it would seem an straightforward conclusion that the two views were taken at the same time. The comparison of photograph and drawing illustrates the capabilities and limitations of each practice. The perspective of the photograph is entirely dictated by the optical specification of the lens. The perspective, scope and movement of the drawing is dictated by living conception and perception. The photograph mechanically records, within the limits of its resolution and its orthography, the forms of every detail. The drawing on the other hand transmutes that detail into rhythm and relation. If I am correct about the date of the drawing, then it was made towards the end of one of the most sustained and intense periods of scrutiny of rock and mountain form every undertaken by any artist. Drawing is an accumulative and assimilative process. Every drawing enters into an understanding of the subject, every understanding deepens and shapes perception. Over this summer Ruskin had entered more deeply than anyone into the nature of the ice-moulded and shattered rock form of the Mont Blanc massif. Though the drawing registers the outline and spatial contours of its subject, its draughtsmanship transmits a sense of the transmutation of material across time. One wonders what he would have thought of the hoard of visitors today, who come up on the train, wielding every kind of photographic apparatus from phones to high-end cameras, 4k video, or even (and I do so much want one) a drone (!). 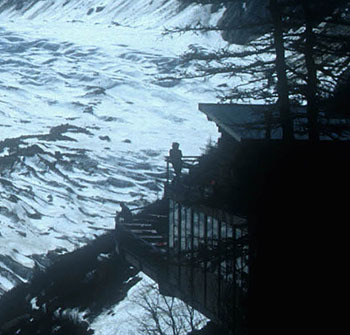 ‘In 1843 [Forbes] solved the problem of glacier motion for ever, – announcing, to everybody’s astonishment, and to the extreme disgust and mortification of all glacier students, – including my poor self (not the least envious, I fancy, though with as little right to be envious as any one), – that glaciers were not solid bodies at all, but semi-liquid ones, and ran down in their beds like so much treacle. Given how large the Mer de Glace figured in Forbes’s research it is perhaps surprising that it features relatively infrequently in Ruskin’s work. There are numerous other subjects in the locality, but his generally looked in other directions or for alternative locations. 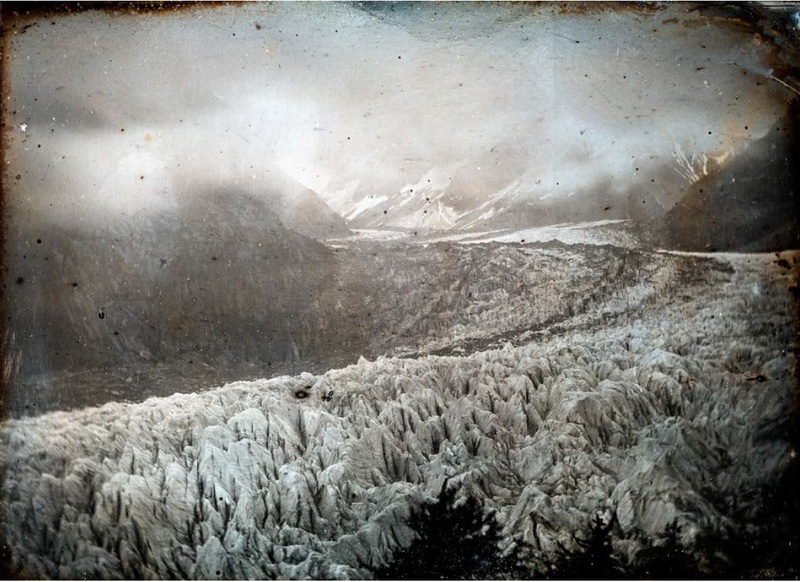 It is perhaps the case that after Forbes had made so much of it, Ruskin viewed the Mer de Glace as exhausted in terms of its personal potential. 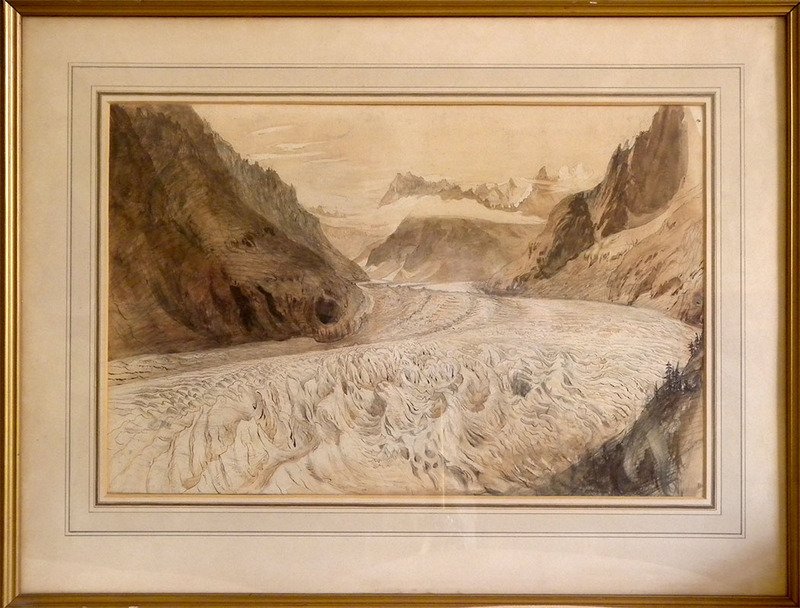 He did, however, return to this exact subject in 1874 in a watercolour of The Mer de Glace from the Montanvers above Chamonix at the Ruskin Library, University of Lancaster (RF 1996P1206). 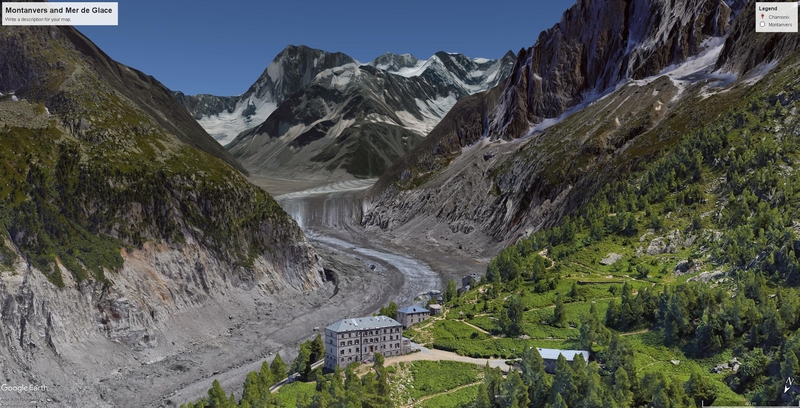 This returns to the classic view of the Mer de Glace from the Montanvers, and looks to have been painted direct from nature, and very likely from a room in the Montanvers Hotel. This drawing is dated 1874 in the catalogue in Ruskin’s Works, but in the recent literature has most frequently been dated to 1849. 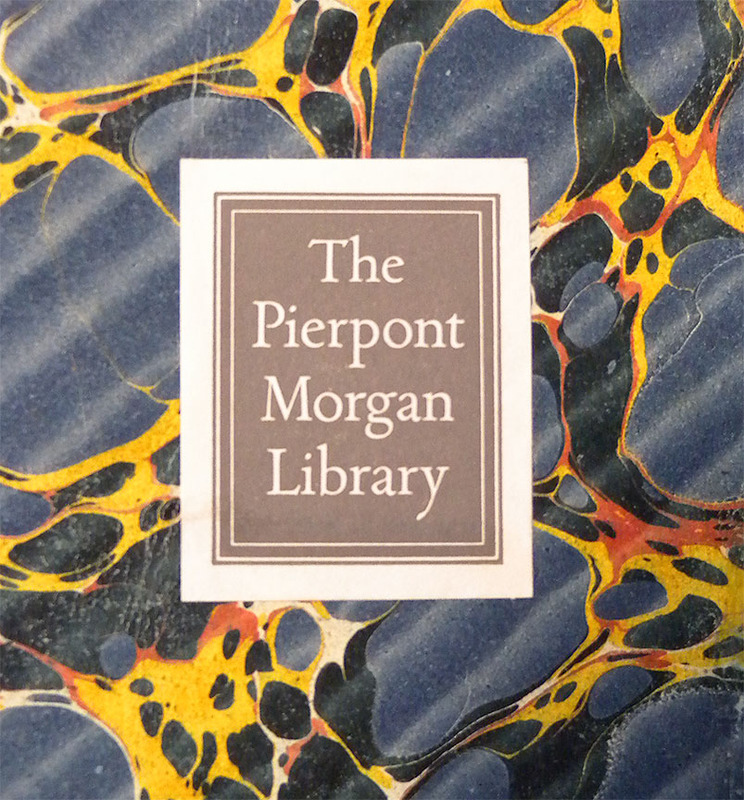 It currently stand thus in the online catalogue of the Ruskin Library at the University of Lancaster. This drawing, however, is surely that documented in a letter dated 14 October 1874 to Mrs Simon from Chamonix (Works 37/145) in which Ruskin mentions going up to the Montanvers to make a drawing of the dirt bands from the window of the cabane for his forthcoming Oxford lectures. Works speculates that this might be the Lancaster drawing. 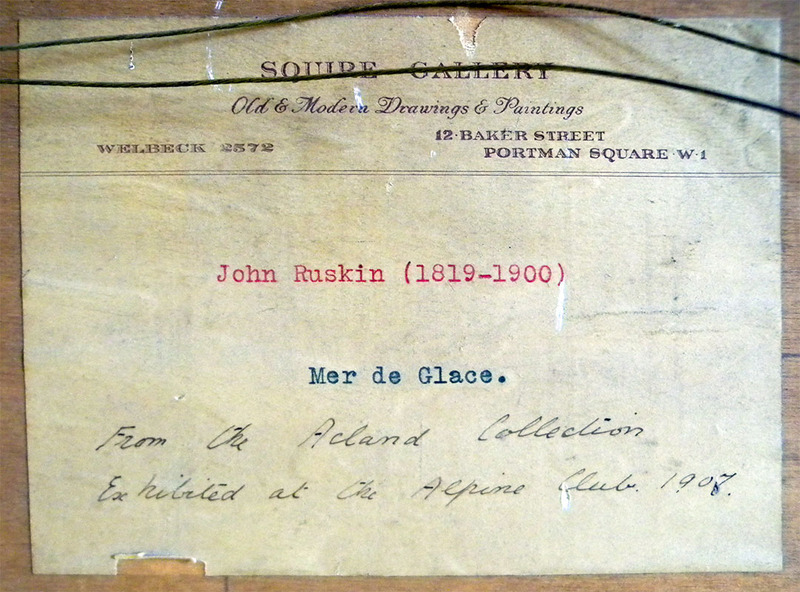 Ruskin’s Diary for 17 October 1874 records that he spent the morning finishing his glacier drawing. Click on any image to open gallery with images full-size. Scroll from image to image and then close (top right) to return to this page. The comparison with the King’s College drawing is illuminating. The handling of the Lancaster drawing is subtly developed and refined. Whilst on the one hand more relaxed, it is also equally as observant; the treatment of the Aiguille du Tacul in the centre, being both more deft and better assimilated. The use of colour to infuse the scholarly content with imaginative depth is also extremely marked, and a significant degree of development in Ruskin’s artistic power becomes evident albeit employed with considerable restraint and subtlety. It is interesting to compare the state of ice in the Lancaster drawing with that recorded in that at King’s. It seems clear from the glacier edges to the left and right that the ice is lower in the later drawing by three or four metres at least. It is now perhaps thirty metres lower still, and in the summer a slew of rocky debris. The glaciers around Chamonix reached their peak in recent history in 1822, so were in retreat during Ruskin’s entire career. He was one of the first to sound the alarm about climate change. By the 1870s, to him it was yet more evidence of the onset of an era of corruption and debasement. He would not be at all surprised by the continued trend of the last 150 years. This entry was posted on December 6, 2018 by Professor David Hill in Ruskin and tagged Alps, Chamonix, Daguerreotype, France, John Ruskin, King's College Cambridge, Me de Glace, Mont Blanc, Montanvers, Morgan Library, Ruskin Library, Savoy, University of Lancaster.